A few weeks ago I had the pleasure of traveling to Toronto, Ontario, Canada with Renee and Christy from Visit Baton Rouge. We set out to attend the Travel Blogger Exchange, also known as TBEX. I’ve been to quite a few conferences in my day from Political Science to the National Beer Wholesalers Association. I’ve also attended and spoken at a few social media, food blogging, and beer blogging conferences, so I figured travel blogging would be right up my alley. After all, I am a travel blogger at heart, just though the lens of everything Ieat and drink! Air Canada has a non-stop New Orleans to Toronto flight, and I’m extremely grateful we were able to utilize that plane. Each seat had its own TV screen with on-demand programing, movies, and more. Renee and I joked before boarding the plane that they should all have USB ports for charging phones and such, and sure enough, Air Canada had that too. I took my seat, charged my phone, and watched The Hobbit the entire flight. The movie ended up being longer than the plane ride, so I missed the very end, but I had seen it before so I wasn’t too disappointed. I had made it to Canada. Actually, this was my first time out of the country since my legendary European adventures of 2006, so I smiled as I made it through customs and received another stamp on my passport. We arrived via cab to the Intercontinental next to the convention center in downtown Toronto. A couple thoughts struck me along the ride. First, Toronto is a large city. Over 5 million people, in fact. I knew they called it the New York of Canada, but I still didn’t quite expect the sprawling urban landscape along with the multitude of high rise buildings. Looking around you could see multiple downtown areas and nearby cities such as Mississauga never even really escaped the vastness of Toronto. And we could see the CN Tower. And it is tall. 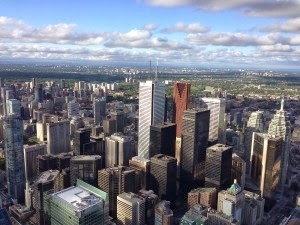 Downtown Toronto from 1,000 feet up in the CN Tower! Second, aside from having to use my passport, the street signs being in English and French, and having to get some Canadian cash at one point, I never really felt like I left the United States. Granted, we were right across a lake from upstate New York, but still, the culture just didn’t seem much different. Toronto is a global city and its culture really is a hodgepodge of worldly cultures all coming together in a North American metropolis. Third, I needed to eat some poutine. Pronounced noticeably different from boudin, I’d come to find out. Okay, I already knew that, but it was a running joke. That first night there, after getting checked into the hotel, we decided to just have a few drinks and eat some food at the hotel bar/restaurant. We met Jay Tusa from the Louisiana Office of Tourism and Joanne who is an international rep for the Louisiana Office of Tourism. 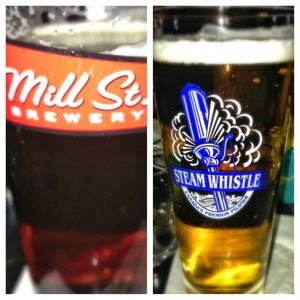 I tried some local beers like Mill Street Brewery’s Tankhouse Ale and Steam Whistle Pilsner. 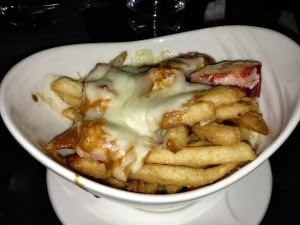 We ordered a round of appetizers, but the one that really stuck out had to be the lobster poutine. Now that’s a dish that I can’t get back home. Essentially poutine is just Canada’s cheese fries, only instead of regular cheese they use curds and they also add some gravy. Of course, lobster poutine includes some nice pieces of lobster tail and claw meat as well. Can’t really argue with that! The next morning presented a golden opportunity for me to go to the St. Lawrence Market, one of the largest and highest rated food and farmers markets in the world. I took a walk down construction-riddled Front Street until I arrived at my destination. Passing a Starbucks, Lonestar Grill, Quizno’s, and Chipotle, I felt right in the middle of Anywhere, USA. However, once I got to the Lawrence St. Market, I knew I had arrived somewhere at least a little different. The market is full of vendors slinging fresh seafood, meats, produce, cheeses, and much more. 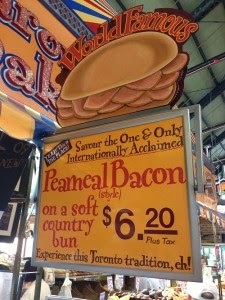 My sources told me to keep an eye out for the famous Peameal Bacon on a Bun, the real true Canadian bacon. I found what I had been looking for at the Carousel Bakery booth but noticed that they seemed to be operating under a cash-only policy. Not having exchanged my dollars for… dollars, I found an ATM and withdrew some Queens. I got my peameal bacon and a sense of Canadian pride overwhelmed me. This is not something I had ever had before. This is not the same as what we put on our pizza and call Canadian bacon. 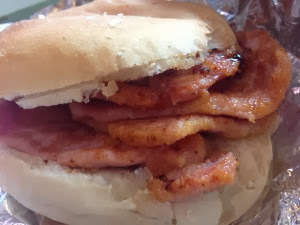 This bacon, the peameal bacon from Carousel Bakery at the St. Lawrence Market in downtown Toronto, is legit. Salty, fatty, and ever so porky, the layers of swine melted in my mouth as I devoured the sandwich on my way out the market. I had to get back to the convention center and check in for TBEX. We’ll get to that in part two of my trip to Toronto with Visit Baton Rouge! 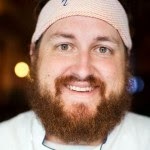 You can find him on his blog, and keep up with him on Twitter and Facebook!